2.Size: UK S=Tag Size L, UK M=Tag Size XL,UK L=Tag Size 2XL, UK XL =Tag Size 3XL, UK 2XL=Tag Size 5XL. 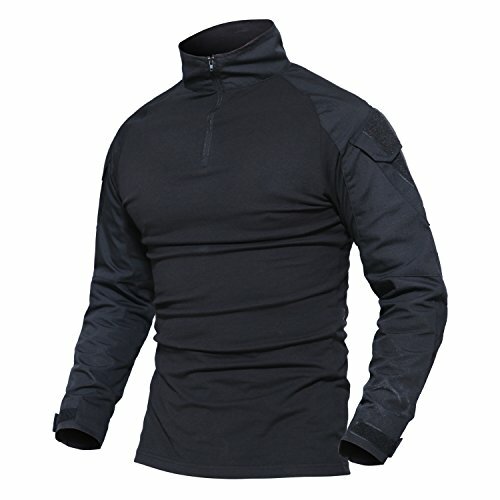 3.Tactical Response Uniform Sleeve,Slim Fit T-Shirt. 4.The Combat Shirt Is Lightweight and Breathable Offering You Superior Comfort And Range Of Motion. 5.Arm Pockets, Zipper Pockets, and Patches For Your ID Or Unit Patches. 6.Abrasion Resistant Forearms,Hook and Loop Adjusted Cuffs. According to the reviews, we have revise the size.Please refer to the UK size chart in the description before purchasing. Polyester/Cotton,,Middle is Cotton with Elastic.Sleeve is Rip-stop Material. ARM POCKETS,and Patches for your ID or unit patches and Accessories.